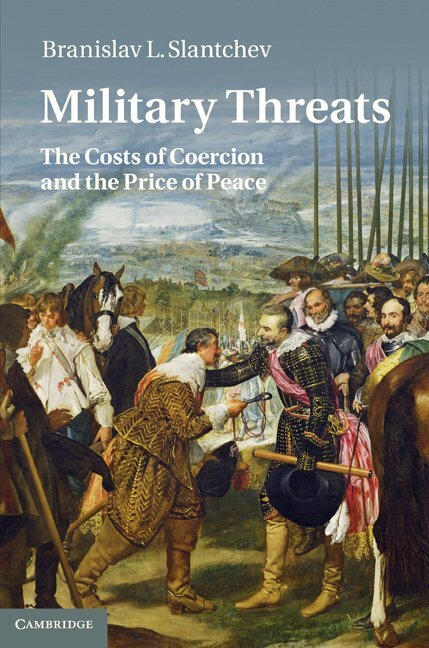 Military Threats: The Costs of Coercion and the Price of Peace. Amazon sells both the hardcover and paperback editions. The Power to Hurt: Costly Conflict with Completely Informed States. American Political Science Review, Vol. 97, No. 1, pp. 123-33, February, 2003. The Principle of Convergence in Wartime Negotiations. American Political Science Review, Vol. 97, No. 4, pp. 621-32, November, 2003. How Initiators End Their Wars: The Duration of Warfare and the Terms of Peace. American Journal of Political Science, Vol. 48, No. 4, pp. 813-29, October, 2004. The Political Economy of Simultaneous Transitions: An Empirical Test of Two Models. Political Research Quarterly, Vol. 58, No. 2, pp. 279-94, June, 2005. American Political Science Review, Vol. 99, No. 3, pp. 459-62, August, 2005. Military Coercion in Interstate Crises. American Political Science Review, Vol. 99, No. 4, pp. 533-547, November, 2005. Territory and Commitment: The Concert of Europe as Self-Enforcing Equilibrium. Security Studies, Vol. 14, No. 4, pp. 565-606, October-December, 2005. Politicians, the Media, and Domestic Audience Costs. International Studies Quarterly, Vol. 50, No. 2, pp. 445-477, June, 2006. American Journal of Political Science, Vol. 51, No. 4, pp. 755-771, October, 2007.
International Studies Quarterly, Vol. 52, No. 2, pp. 335-362, June, 2008. In International Studies Encyclopedia, edited by Robert A. Denemark, Vol. IV, pp. 2591-2610. Chichester: Wiley-Blackwell, 2010.
International Organization, Vol. 64, No. 3, pp. 357-388, Summer, 2010. American Journal of Political Science, Vol. 55, No. 1, pp. 135-148, January 2011. Audience Cost Theory and Its Audiences. Security Studies, Vol. 21, No. 3, pp. 376-382, August, 2012. Borrowed Power: Debt Finance and the Resort to Arms. American Political Science Review, Vol. 106, No. 4, pp. 787-809, November, 2012. Interational Organization, Vol. 67, No. 4, pp. 759-96, Fall, 2013. American Political Science Review, Vo. 109, No. 2, pp. 297-313, May, 2015.
International Organization, Vol. 72, No. 1, pp. 1-31, Winter 2018. Comparative Political Studies, forthcoming, 2019. Too Much of a Good Thing: The Mobilization of Public Support and the Breakdown of Peace. Peace Economics, Peace Science and Public Policy, Vol. 23, No. 4, pp. 1-14, 2017. Book review. Paths to Peace: Domestic Coalition Shifts, War Termination, and the Korean War by Elizabeth A. Stanley and How Wars End by Dan Reiter. Perspectives on Politics, Vol. 9, No. 2, 2011. Book review. Steps to War: An Empirical Study by Paul D. Senese and John A. Vasquez. Political Science Quarterly, Vol. 124, No. 2, pp. 386-88, Summer 2009. "American Rendition." Book review of The Dark Side by Jane Mayer. San Diego Union-Tribune, July 13, 2008. "Apocalypse Then, Apocalypse Now." Book review of The Infernal Machine by Matthew Carr. San Diego Union-Tribune, April 29, 2007. Book review. Trust and Mistrust in International Relations by Andrew Kydd. Perspectives on Politics, Vol. 4, No. 3, pp. 632-633, September, 2006. "Disastrous Foreign Policy: What Will Clinton Be Remembered For?" Democrat and Chronicle, April 13, 1999. Rochester, NY. "Whither Yugoslavia? NATO's Objectives in Kosovo,"
Chris Wignall (PhD Economics, 2010), Quant Economics, Inc.
Mark Culyba (PhD, 2011), McKinsey & Co.